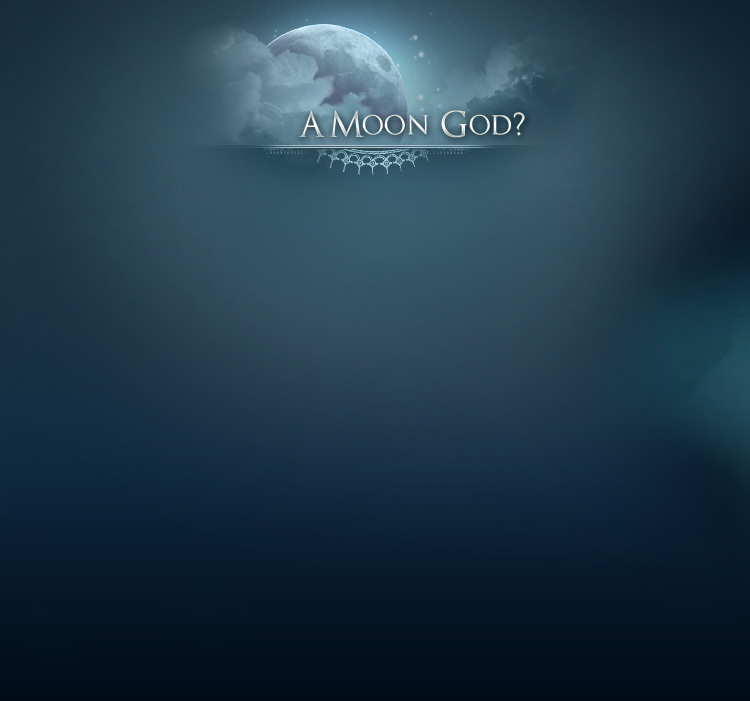 Allah - A Moon God? "And from among His Signs are the night and the day, and the sun and the moon. Do not bow down (prostrate) to the sun nor to the moon, but only bow down (prostrate) to "Allah" Who created them, if you (really) worship Him." "They ask you about the new moons. Say: These are signs to mark fixed periods of time for mankind and for the pilgrimage." Why does Islam follow a lunar calendar? In both the Bible and the Quran religious festivals are regulated by the lunar calendar. Jews and Muslims have kept to these regulations which they believe to be from God. Why does Christianity follow a solar calendar? Why is the feast of Ramadan marked by the appearance of the crescent moon? I think you mean the fast of Ramadan. God commanded Muslims in the Quran to fast from dawn to sunset during the month called Ramadan (see Quran 2:185, 187). The beginning and end of the month is determined by the crescent (2:189) based on the instruction of God's Messenger, on whom be peace. Why this method and not another is not for us to say but for God and His Messenger to prescribe. However, I find it an efficient method. It is a universally applicable method, and it allows for Ramadan to move through all the seasons. This allows believers to have the pleasure of worshipping God by fasting in all the various seasons: one year in the summer, some years later in the winter. Why does the Quran place the Sabians on the same level with Jews and Christians when scholars have clearly proven that the Sabians were involved in the moon cult? "Those who believe and those who are Jews and Christians and Sabians, whoever believes in "Allah" and the Last Day and do righteous good deeds shall have their reward with their Lord. On them shall be no fear, nor shall they grieve." While they are all offered the same opportunity for improvement, nothing, is said in this verse about the validity of the existing faiths of these four communities. Otherwise the Jews and Christians who are criticized in the Quran for their deviations will not be placed on the same level with the believers. The matter becomes clear when you realize that believers here does not mean saved persons but those who ostensibly belong to the community of Muslims. They, as well as the other three groups, must do the following to be saved: believe in "Allah", believe in the Last Day, and do right. Doing right, according to the Quran, includes following every teaching of Muhammad. Did the Meccans worship the true God since they recognized "Allah"? Was "Allah" one of the gods of the Ka'bah? And if so, where did the Meccans derive the recognition and the name of "Allah" from? First, "Allah" was not one of the 360 idols which were in the Ka'bah, although Morey has claimed this without evidence. When the Prophet Muhammad (peace be upon him) entered Makkah victorious he went into the Ka'bah and broke the idols therein. Second, the word "Allah" has been used all along for the name of "God" in the Arabic Bible for Jews and Christians alike. The proof is easy to verify; simple go to any hotel or motel on the earth and look in the drawer next to the bed and take out the complimentary Bible, placed there by the Giddeons and then look on page 5 or 6 where they list the examples of translations they have made into other languages. The second example given is for Arabic speakers. The verse is from the Gospel of John, chapter 3, verse 16. Everyone knows this one; "For God so loved the world..." and the word in Arabic for "God" is "Allah." Then if you have a Bible in Arabic, look on page one in Genesis, and you will find the word "Allah" 17 times. Next, the word for "God" to the Arabs, ever since the time of Abraham (peace be upon him) has been "Allah" and He is to them, the Lord of the Ka'bah (the black box in the center of the Holy Sanctuary in Makkah). He was the unseen God whom they would call upon when in distress. Yes, they worshipped the true God but their worship was not purely for Him. They also worshipped other gods thinking that they would act as intermediaries between them and the true God Allah. The Arabs know of Allah because Abraham visited Makkah and together with his son Ishmael laid the foundation of the Ka'bah. The descendants of Ishmael retained some of the worship rites and beliefs from Abraham. This included their knowledge of the true God Allah. Elsewhere we have shown conclusively that the true god, "El" of the Bible is the same as "Allah" of the Quran. Please refer to: "Yahweh, Jehovah, or Allah - What Is God's Real Name?" by Sheikh Shabir Ally.